Crafted ERP’s production management capabilities enable organizations to run their manufacturing operations efficiently. From sales order to production order processing, routing and scheduling, order fulfillment and product costing, Crafted ERP’s manufacturing solution provides real-time visibility into every step of the production process to help you make better-informed decisions. 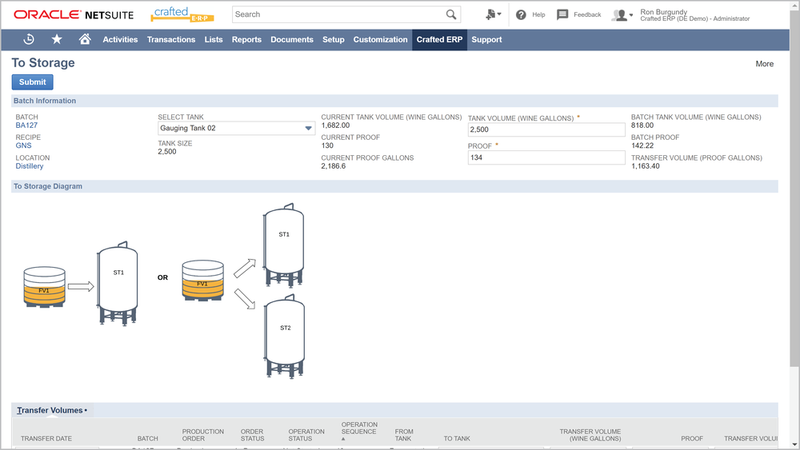 Get your products to market quickly and cost-effectively anywhere in the world with an end-to-end manufacturing software solution designed to run your entire craft beverage business. Crafted ERP’s manufacturing functionality can be configured depending on how much control and influence you want over your production process. Crafted ERP’s advanced manufacturing module offers the ability to manufacture in batches with automatic batch creation, full traceability, production control and scheduling. Crafted ERP offers companies the flexibility to define batch sizes during the production process and automatically creates batch records. Every batch is processed and tracked uniquely and, when combined with NetSuite’s native lot tracking functionality, provides complete end-to-end traceability. Machines, employees, work centers and assets are then scheduled and assigned to each individual batch and the manufacturing execution systems barcode and tablet interfaces ensure that all this information is tracked and updated in real time. Crafted ERP's Demand Planning module offers several ways to calculate and predict demand based on historical demand, open opportunities and manually entered or imported sales forecasts. Whether you want the system to review monthly or weekly demand and generate forecasts using moving average, linear regression or seasonal average calculations you will have the ability to review and edit the forecasted demand before proceeding to supply planning. You can also have the system create demand based on sales forecasts. MRP is one of the standard methods for balancing demand and supply. NetSuite’s Demand Planning functionality provides the ability to explode BOM’s, check inventory and safety stock levels, review demand and analyze supply before generating planned orders. And it’s all done in the cloud with minimal overhead.